I love my tablet and phone, but I do not like paying extra for all of the nifty accessories. While I feel strongly a good case is important to protect my device, I try to limit my accessory purchases. No need to do without those holders and chargers, hack it together instead. 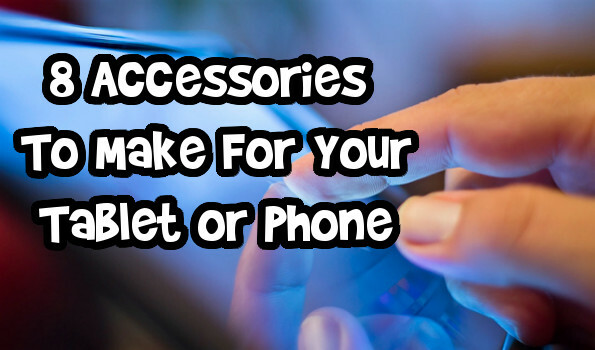 Here are some great DIY Accessories for your tablet or phone that you can make much cheaper than buying. This unique handmade docking station will look super chic in your house, or is fancy enough to give it as a gift. Check out this hack from Scarlett Words to create a simple charging station from a slice of wood and a lightning cable. A handmade docking station like this one would run $50-$80. This hack could easily be adapted to charge any device. Attach a small portable speaker and you can also jam to all your favourite tunes. I do not use paper recipes very often anymore. I am always consulting my tablet or phone for new recipes to use in the kitchen. Check out this solution to spilling the flour on your iPad from Mamie Jane’s. This beautiful tablet holder made from an upcycled wood cutting board, a child’s block, and a scrabble tile holder is just my style. Beautiful and chic, no one will know you made it yourself instead of spending $40-$50 on a similar holder. Love the look of a case covered in bling? I hate that $25-$50 price tag that usually goes with it. Use the tutorial at Crafting Rebellion instead to create a super shiny case on a budget. Pick up a less expensive case at the dollar store and let your glue and jewels do the magic. Picture this, you are out in the snow and something funny happens. You whip out your phone and your hands freeze as you try to snap the perfect shot. Rewind that scenario and turn your favourite gloves into tech gloves with this cool hack from natalme on Blogher. With a needle, metallic thread and your favourite pair of gloves, in just a few minutes you can make any gloves touch screen responsive. This blogger suggests special conductive wire, but it is possible to use any conductive metallic thread. Test the thread in a shop by holding one end of the skein while brushing the other end on your phone to see if it responds. A cheap pair of super thin gadget gloves will cost about $10-$15. A nicer pair that will keep your hands warm all winter can easily cost $40-$80. Blackcabbit has a great solution to turn your iPad or other tabler into a movie theater for your kids on long trips. Using some elastic and a few other small items, this dad creates an entertainment system that stays put. This is perfect if your kid falls asleep during movies on car rides. Most commercial headrest mounts range from $25-$40. I made a similar mount for my daughter before our last road trip and it worked perfectly. If you spend some time commuting in the cold, you need to make these tricked out earmuff headphones from Brit+Co. These earmuffs do require some basic sewing skills, but even a novice sewer like me should be able to complete these. Make yourself a pair in any style instead of splurging for a $20-$65 pair. I can remember sitting down in my grandfather’s living room while he proudly showed off his slides from years ago. Impress your friends without a pricey digital projector by displaying your photos on the wall. This projector from Photojojo will only cost you a single dollar. While the image may not be perfectly clear, a crisp digital projector will cost you $75-$200. Project movies on the wall for a fun movie night. I love those armbands for running that securely hold my device while exercising. Each one can easily cost $30 and I am a fickle about keeping up my exercise program, so I am always hesitant to buy them. Enter this creative no-sew arm holder from Wonder How To. With a placemat, some strong glue and two hair ties you can make your own quick holder. For a more adjustable version, make the armband a little longer and add some velcro strips. Bargainmoosers, what tech accessories would you love to have?